Part of the Cinco de Mayo celebrations, Adorama is offering 5% promotional rewards on select DSLRs and Mirrorless models. The offer is good until 5/9/16. The promotional rewards are in addition to any other free accessories the camera may be eligible for. Participating kits include the Nikon D5300 and D5500 and J5, the Canon D-Rebel T5 and T5i, and the Panasonic GM5. After many years of waiting, the Nikon V2 is now down to earth in terms of prices. You can get the white Nikon V2 body only in manufacturer refurbished condition with a 90 day Nikon USA warranty for $300 with free shipping at Adorama as one of their 4200+ clearance items. Also bubbling around among the eBay Deals is a big promotion from BuyDig’s eBay store. A total of 101 items are participating as of the time of writing, including DSLRs, mirrorless cameras, Lenses, and Coolpix cameras. It is a “Buy 1 Get 1 at 10% off” offer. It activates in the shopping cart when you add any two items to your shopping cart. The value of the least expensive item is discounted, so strategically this works best if the items you are buying have similar prices (or you are buying two of the same). You can see all eligible items at the BuyDig Certified Refurbished promotion. Make sure you also check pages #2 and #3 over there, or sort by price (High or Low), or use the Categories on the left hand side of the page over there to drill further down. It’s Prime time for the 1-System shooters with the Nikon 1-System 10mm f2.8 Lens on sale for $147 with free expedited shipping in either black or white, and with 4% promotional rewards ($6~) at B&H Photo. Another potentially interest discount surfacing during the price-charts price-checking. 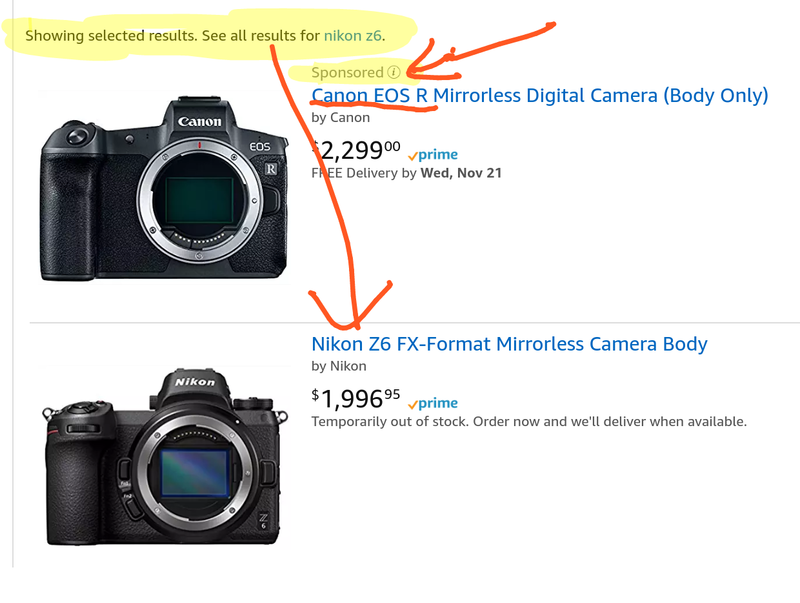 Nikon is artificially keeping the price of the AW1 with 11-27.5mm at $700 (same price as in December 2014 when we did the previous price chart)… But if you want to get the kit, you can get it in refurbished condition, in the white color scheme, for $430 with free shipping and a 90 day Nikon USA warranty by Adorama. If you are fond of red cameras, or at least you do not object to them, and you want to try out the Nikon 1-System without committing too much money on the curiosity, BuyDig.com has the red color scheme of the Nikon S2 with 11-27.5mm on sale for $170 with free shipping. This is new condition with Nikon warranty. Only the red is on sale like this. The white Nikon 1 AW1 Waterproof Camera with AW 11-27.5mm f3.5-5.6 Lens is currently available in manufacturer refurbished condition for $430 with free expedited shipping and 90 day manufacturer warranty at Adorama. The other colors are only available in new condition ($700 with free accessories). The white color scheme of the factory refurbished Nikon 30-110mm VR (CX 1-System) lens is currently going for $110 with free shipping by BuyDig.com with a 90 day Nikon refurbished warranty. The Nikon CB-N2220SA Body Case Set for the Nikon J5 1-System mirrornyet camera is currently going for $55 with free expedited shipping at Adorama. Speaking of Nikon 1-system items, the Nikon EP-5C Power Supply Connecter for the J1, J2 and AW1 is on sale for $10 at Adorama. For the Nikon CX 1″ Angry Inch 1-System, Groupon Goods is offering the camouflage color scheme of the manufacturer refurbished Nikon 30-110mm VR lens for $110 with free shipping and free returns and 90 day Nikon warranty. Delivery within 7 business days after purchase. Big discount if you happen to have a camera that fits this. The official Nikon WP-N1 Waterproof Housing (for the Nikon J1 and J2 mirrorless cameras) is now down to $97 with free shipping, in new condition, at B&H Photo. The manufacturer refurbished Nikon 30-110mm f3.8-5.6 VR lens with a 90 day warranty is on sale for a limited time for $110 with free shipping (with the usual limit of five) at Groupon Goods. This is a limited time offer but they don’t mention a specific expiration date. Back to the eBay Deals we geaux where we find the new condition Nikon J4 with the 10-30mm lens for $220 with free shipping with a limit of five per buyer. Nikon has revealed yet another new camera in their CX 1-inch mirrorless system. The new J5 will be available bundled with multiple lenses, starting at $500 with the 10-30mm VR, $750 in a two lens kit (10-30, 30-110), and $1050 with a zoom-zoom lens (10-100mm). Available in different colors. Pre-orders accepted at Adorama et al. Zoom-zoom! BuyDig is offering the new condition white Nikon J4 with 10-100mm f4-5.6 VR lens for $450 with free shipping. Expires by 3/29/15. This limited time offer ended… If you are curious about the Nikon CX 1-System, BuyDig’s eBay store is offering the manufacturer refurbished Nikon S1 with 11-27.5mm for $110 with free shipping, available in either Khaki or Red color schemes, with a limit of five per buyer. If you are CX 1-System Nikon curious, BuyDig has a coupon promotion, you can get the manufacturer refurbished Nikon J1 w/10-30mm VR (white color scheme) for $150 with free shipping when you use coupon code HDPIX (expires 2/15/15). Price before coupon is $160. Speaking of BuyDig, coupon code DIG5 gets you $5 off an order of $99 or more at their Blowout Sale. If you are fond of white color cameras and the Nikon CX 1-System, the white Nikon J4 with the 10-30mm is offered in new condition for $330 with free shipping, with a limit of five per customer, by authorized Nikon dealer BuyDig on eBay. If you have one of the compatible Nikon 1-System CX cameras, the Nikon WP-N1 waterproof housing is currently on sale for $97 with free expedited shipping at B&H Photo. If you are Nikon CX-curious (1″ 1-System mirrorless), BuyDig is offering the refurbished red Nikon 1 J3 w/10-30 VR with a free case for $180 with coupon code EMPROSEG entered over there. This expires by end of day 12/22/14. For a limited time, B&H Photo is offering the Nikon WP-N1 Waterproof Housing for Nikon 1 J1 / J2 Digital Camera for $100 with free shipping. This is only the UW housing. Camera not included. If you are interested in the Nikon V2 1 System CX mirrorless camera, B&H Photo has a sale on six Nikon V2 kits with the body only going for $400, the with 10-30mm kit for $500, and the two lens kit for $600 (10-30, 30-110), and the with 10-100mm for $700. You also get 4% promotional rewards, and a free case. On the other hand, if you are looking for an entry into the CX system without breaking the bank, the red Nikon S1 with 10-30mm and free case continues to go for $150 at B&H Photo (but the bundle with the underwater housing sold out very quickly). If you don’t care for the Waterproof Housing offer, you can instead get the Red Nikon 1 S1 with 11-27.5mm and case for $150 with free shipping from B&H Photo. Adorama has launched a wave of Nikon offers. A number of cameras includes extra accessories and/or promotional rewards and free shipping. They have separate pages for their DSLR offerings and Mirrorless offerings and P&S offerings. Due to time constraints I can’t price check every single item listed in all those pages, so that is a DIY adventure. This doorbuster sold out… B&H Photo has a Nikon 1 System e-doorbuster, for $200 total with free shipping you can get the Red Nikon 1 S1 with 11-27.5mm with WP-N2 Waterproof housing and an extra bag. As of a 11/26/14 recheck, this is currently sold out and cannot be ordered… If you are curious about the Nikon CX 1-system but don’t want to break the bank, you can get the black factory refurbished Nikon J3 with 10-30mm VR for $190 with free shipping at BuyDig.com. Offer ends by 11/23/14. For more sale items, check their November 2014 Blowout Sale (expires 11/30/14 or earlier for items that sell out).